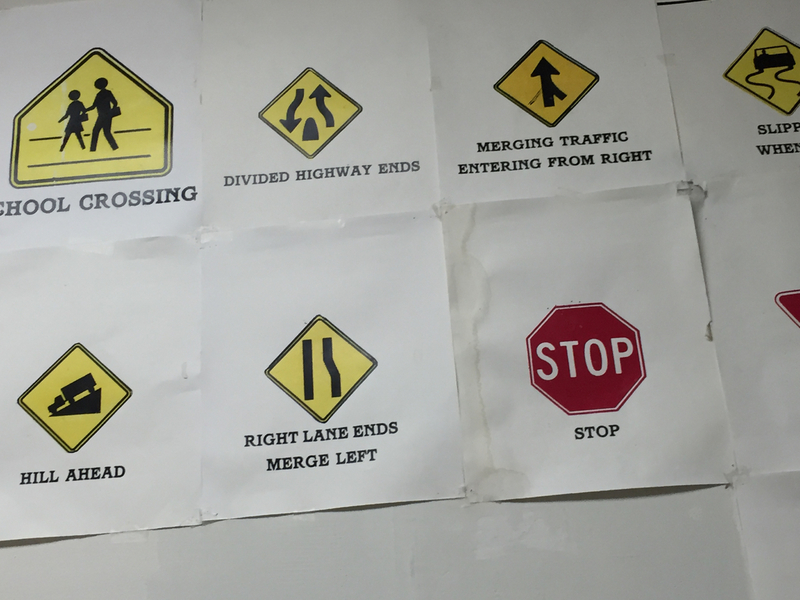 Last week I went to Chinatown and enrolled in a driving school. At the age of 61 I will finally get a driver’s license. Not that I don’t know how to drive, I learned to do that a long time ago, I even had the nerve to “borrow” a friend’s car once in a drunken stupor. Well, more like the remnants of a drunken stupor, an early Sunday morning with empty streets and four hours of sleep. Still not quite hangover time. But that was a long time ago, and after I sobered up I had a hard time parking the car since I’d never been shown how. My friend knew someone had driven the car in her absence right away. A few years later I made a half assed attempt to get my license when I was trying for a job with the Parks Department. To get the job you had to have a license. A few friends tried to prepare me, Gary with the little red Honda Civic, Paul with his BMW. That was a nice car. My co-worker Carlos who took me to Randall’s Island, to the Sanitation school course and let me maneuver his big boat of a Bonneville around the cones. Carlos I had to pay, $10 a lesson or something. I took the 5-hour class at some place on Metropolitan Ave. near my apartment in Greenpoint. I signed up to use his car for the test, and on test day on the way there he told me I wasn’t ready. I don’t even think I knew how to park. He gave me a lesson, and I went for the test the following week. Needless to say, I failed within two minutes of leaving the curb. That was 25 years ago. Since then I’ve driven exactly three times. In 2001 I had to drive my friend Andy’s car about 20 feet on Broadway near the Williamsburg bridge so he could find out what was making a weird noise in the back. In 2010 my wife Danusia let me drive the golf cart we rented on Isla Mujeres in Mexico. The following year she let me drive our rental (a Kia Santa Fe) for a bit through Death Valley. We were the only ones on the road and I could see for at least 20 miles in front of me. I like the feeling of driving, don’t like so much the feeling that I might cause an accident. Not that I’m particularly accident prone, but being dyslexic extends to my reflexes as well as my eyes. Even when I try and dance in time to the music I’m always a beat behind and can never quite get In step, so I’m afraid of what may happen on some highway, where I think I should go left but my brain thinks it should go right. Or something like that. But hey, if some of the people I know can get behind the wheel of a multi-ton steel projectile why can’t I? Why not indeed? I’m good with tools and machines, and that’s all a car is, a tool and a machine. Just a little bigger and harder to get used to. So Sunday I went to my 5-hour class in Chinatown, and I was wondering what could be so involved about driving that it would take five hours. I can’t remember what took five hours in 1990, but I remember getting through it. I showed up on time and met Mr. Yum. Not his real name, but let’s say it’s appropriate. 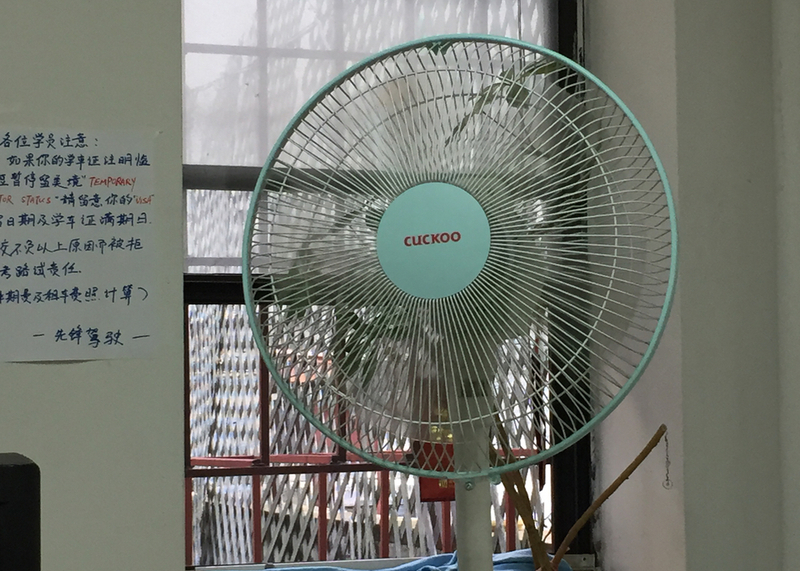 There was a fan that said Cuckoo on the table with an old fashioned analogue TV. Only in Chinatown. 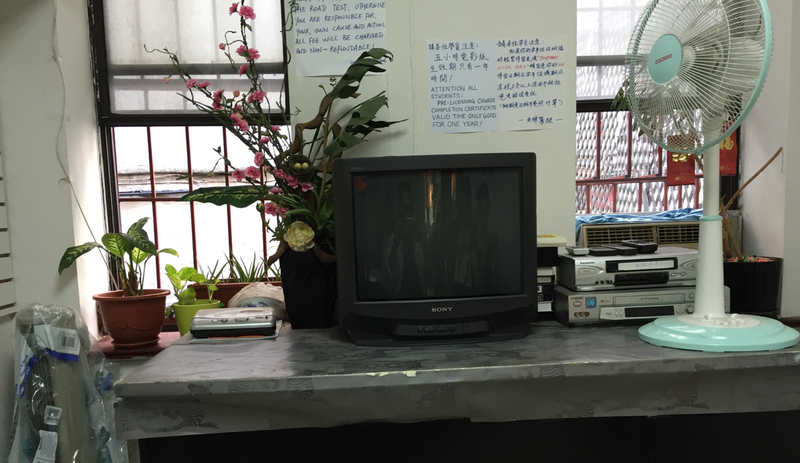 After we were all seated, about twelve of us, Mr. Yum came in and inserted a VHS cassette into the VHS player. “You watch the movie and after about an hour I come back to talk to you,” he announced. The program came on and for an hour we watched videos about stopping distance, signaling, lines on the highway, and the dangers of drunk driving. This came at the very end, where there was a vignette badly acted out by fifth-rate actors. It was like watching a public service soap opera. I for one know what it’s like to drive after having one or two beers and I wouldn’t do it, but I can’t speak for my fellow students, half of them Asian, three other Latinos, and two white women. They were all half my age. Mr. Yum seemed to take a liking to me, we are after all very close in age, and he seemed to get a kick out of some old guy trying to learn to drive. It’s easy not to know how to drive in New York, I know others my age that’ve never had a license or even know how to drive at all. When I was in the army in 1979 we had to learn how to drive an armored personnel carrier, which is like a tank without the turret and big gun. I was all excited about it, at that point in my life I had only driven a manual pickup truck on a farm upstate and couldn’t keep it from stalling long enough to get a decent driving lesson out of it. When my turn came I got in the big APC, which is controlled by two levers rather than a wheel and a gas pedal. That was the extent of the instruction before letting me have control of a 20-ton steel box on tracks. After jolting this thing up and down the track for a few minutes, the instructor who was up in the tank commanders hatch made me stop. “Don’t you know how to drive?” He asked. “No.” I said, looking up at him with a smile. Hopefully this will change after I spend some time in the car with Mr. Yum. After the video was over Mr. Yum came back in and handed us some sheets, they were the grading sheets the test givers use for the NYS driver’s test. Some girl named Amy had taken the test and failed for “poor maneuver control” and losing some 40 points for a bunch of little stuff. We went over each point, like leaving a curb, parking, etc. “Don’t think you have all day to park, or to make the three point turn,” Mr. Yum said. “You have 40 seconds, and if you don’t do it in 40 seconds, you fail. Touch the curb and you fail. Too far from the curb and you fail. I though this would go on for another two hours, and I had to go to the bathroom badly. But Mr. Yum wrapped it up and started calling us up to sign our certificates. “Remember, certificate good for only one year,” he chided. I signed, went to the bathroom, and scheduled my first lesson with Mr. Yum with the girl at the front desk. This entry was posted in Uncategorized and tagged 5 hour class, accidents, anxiety, APCs, blogging, cars, driving, driving schools, fear, learning to drive, New York life, road test, student driver, tanks. Bookmark the permalink.